This week, from Monday, March 18 to Friday, March 22, features Can’t Stop, Won’t Stop at CAAM, The Egg House, Secret Gardens of Forest Lawn Glendale, Movie & Bites at JAPAN HOUSE, The Work and Music of Yoko Ono at Walt Disney Concert Hall, Rooftop Cinema Club and MUCH more. 1. PaleyFest returns to the Dolby Theatre March 15 – 24 for a 10-day television festival featuring stars and creators from some of your favorite TV shows. PaleyFest is a culmination of screenings, panel discussions, Q&A’s and behind-the-scenes looks of a variety of TV shows you know and love. 5. 260LA will host a STAUD sample sale from March 19-24 in their Beverly Hills location. 6. Horse Thief BBQ located at Grand Central Market will host a karaoke night starting at 7 p.m. Drink specials and Tex Mex bites will be offered during. 7. Down some tacos, drink some locally brewed beers and test your trivia skills this Tuesday during Tacos & Trivia night at Angel City Brewery in DTLA. 8. Dreamscape Immersive, the latest contender in location-based virtual reality, has opened in the Westfield Century City mall with three unique adventures that include an alien zoo, a deep ocean dive and an action packed adventure to find a powerful jewel. Open seven days a week. 9. Free admission at: Los Angeles County Arboretum, South Coast Botanic Garden, and Descanso Gardens. 11. The Egg House visits Los Angeles March 20 – 24 for an egg-themed, 12,000-square-foot pop-up multi-sensory experience showcasing a series of installations and activations around egg themed creations. 13.The Super Serious Show is a comedy event produced by CleftClips featuring both established and up-and-coming talent performing an array of stand-up, sketch and musical comedy. Happening at The Virgil. 17. 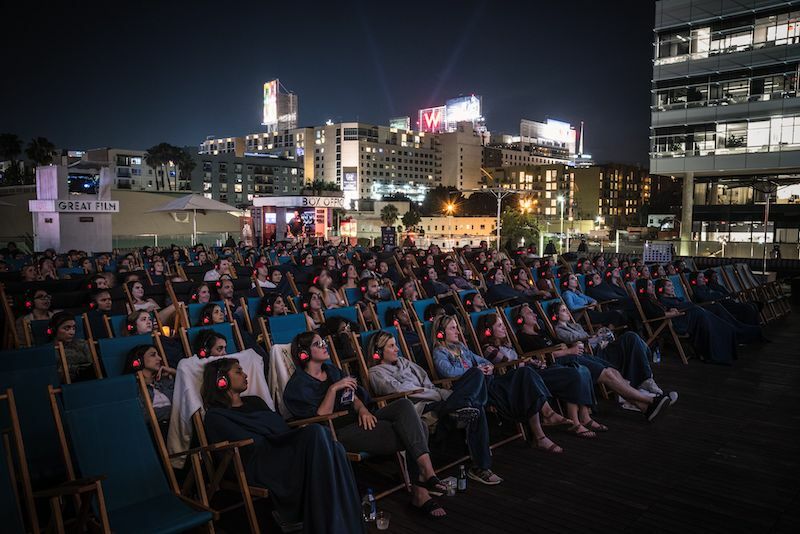 Rooftop Cinema Club returns to the rooftops of LEVEL in DTLA and NeueHouse in Hollywood with multiple screenings this week that include The Greatest Showman, Bohemian Rhapsody: Sing-along and more. 19. Harry Potter can be religious text for some and Harry Potter and the Sacred Text Podcast takes it to a whole other level when they take their podcast live to the Bootleg Theater this Thursday. 20. JAPAN HOUSE presents a new series called “Movie & Bites” a screening and tasting event featuring acclaimed food stylist Nami Iijima and 2009 comedy film “The Chef of South Polar. Iijima was the food stylist for the movie and guests will be treated to dishes straight from the film. 23. Walt Disney Concert Hall presents BREATHEWATCHLISTENTOUCH: The Work and Music of Yoko Ono. Guests will experience Ono’s art and music performed by an ensemble of special guests in celebration of her sixty-plus-year career. 24. The Institute of Culinary Education is now offering recreational classes in their professional kitchens. The kick off class will teach guests how to make fresh handmade pasta and a variety of sauces. 25. Amoeba Music in Hollywood welcomes Jenny Lewis for a signing and performance of her new album. 26. Grand Central Market hosts Friday Night Flights every Friday starting at noon. The special includes a flight of drinks or bites from GCM vendors and a round trip ticket on the historic Angels Flight Railway right across the street for $15. 27. 4th Fridays on 4th Street activates the “Retro Road” business district in Long Beach on the fourth Friday of every month from 6 to 9 p.m. through extended hours, dining specials, discounted merchandise, pop up shops, art shows, live music, trolly rides and more. 28. Desert X returns for its bi-annual public art show February 9 through April 21. Spread throughout the Coachella Valley in various locations, artists are commissioned to use the desert landscape as their canvas with breathtaking results. Eataly Los Angeles’ first-ever Restaurant Fest kicks off Monday March 18. This two-week long festival will highlight Italian spring time cuisine through two-course prix fixe menus from all three restaurants inside the complex. Available during lunch and dinner, prices range from $18-28 and select wines will be priced at just $25 a bottle for the occasion.